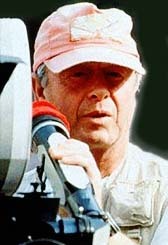 Tony Scott spent about ten years making commercials and most of another decade studying art before making his first feature film at the age of 39 -- the sexually charged vampire noir The Hunger with Catherine Deneuve, David Bowie, and Susan Sarandon. It is a popular rental now, but it bombed in its first release, and Scott spent the next two years making more commercials. His second chance came when high-power producers Don Simpson and Jerry Bruckheimer sought out Scott not because of The Hunger but in spite of it -- they were more impressed by a commercial he made for Saab, showing the car racing a fighter jet. Scott's testosterone-soaked Top Gun made a major star of Tom Cruise, and Scott was suddenly Hollywood's go-to director for action films. Top Gun was Scott's biggest hit, among other blockbusters including Beverly Hills Cop II with Eddie Murphy, Days of Thunder with Cruise and Nicole Kidman, Enemy of the State with Will Smith and Gene Hackman, Crimson Tide with Hackman and Denzel Washington, Man on Fire with Washington and Christopher Walken, and Deja Vu with Washington and Val Kilmer. His 1993 drama True Romance did not find the audience it deserves, but with its all-star cast, non-stop action, and a gritty screenplay by Quentin Tarantino, it might be Scott's best film. After undergoing hip replacement surgery in 2005 Scott brought the extracted bone home and had it polished and mounted by a taxidermist. For many years he was a close friend of acid spokesman Timothy Leary, whose last will and testament named Scott as executor of his estate. Scott said that he kept Leary's ashes in his bathroom. He loved rock climbing and rugby, and was almost never seen in public without wearing a faded pink baseball cap that was once red. Scott and his movie-director brother Ridley Scott were executive producers of CBS's math 'n' murder mystery Numb3rs starring Rob Morrow and David Krumholtz. They also produced the backstage Citizen Kane drama RKO 281 for HBO, and the late-1990s Showtime anthology The Hunger, named for and vaguely inspired by Scott's first film. His wife was actress Donna Scott, who had recurring albeit minor roles in Soldier of Fortune, Inc. with Brad Johnson and Dennis Rodman and Nash Bridges with Don Johnson. She also appeared in several of her husband's movies. Scott took his own life in 2012 with leap from the Vincent Thomas Bridge.